I have Mad as a Hatter, I’ve not taken pics yet but all I will say is that not one single pic I’ve seen does it justice, it simply one of the most beautiful things I have ever seen! I love the look of the Alice one but don’t wear blues really. Gorgeous, gorgeous, gorgeous! I have Mas as a Hatter and this one, but omg, your naaaaaails! They are absolutely stunning…I’m not jealous at all ;). Great NOTD lovely! I need this. Please can you tell me where you purchased??? That looks lovely but I have one question, is it scratchy to the touch? I’ve only ever used one glittery polish which wasn’t scratchy to the touch and that was a Jessica polish. @Rhamnousia – I did mean to say actually… but I’m stupid… This DOES need at least 2 coats of a top coat to make it bearable to touch. I don’t use my Seche Vite on glitters, I don’t like the combination… so I use a cheapy Sally Hansen quick dry. Do I like it?! No, I love it!! Your nails already look awesome in these photos, so I can’t quite imagine how much more fantabulous the colour looks in person! I don’t really usually like that shade of blue in a polish, but i have to say, those pics make it look mouth-watering! Really lovely- you must let us know how you get on removing it hehe!! I probably can’t wait for the US to post… I’m still awaiting a Cherry Culture haul from a couple of weeks ago and the post men at work are bored of my desperation every morning! I just love the color, but I’m not so sure about the glitter part. Ah! Such a lovely glittery shade! At first I thought that I only wanted Mad As A Hatter… but now I can see that i’ll need Absolutely Alice as well! Your swatch is what did it for me! It’s gorgeous, I live Kingfisher blue and glitter! Amazing! wow that looks amaaaazing on you! i seriously love it! i got the mini set and i haven’t tried mine yet, sheesh i need to get on it! just beyond gorgeous!!! was not convinced when i saw just the bottles but on the nail it’s just gorgeous. This is really similar to the cheapy Barry M one I have. I did feel a little ridiculous when my friend’s 7 year old had the same polish on..
What a gorgeous polish–wow! 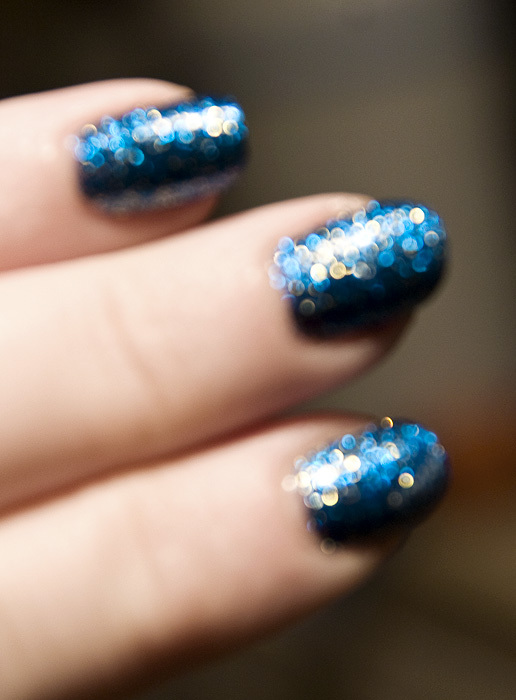 And I ADORE the bokeh shot you took You have fabulous nails, you lucky girl you!